If you have a linen sample of historical value which you would like to have woven again, our hand weavers can do so, starting from a length of 30m. 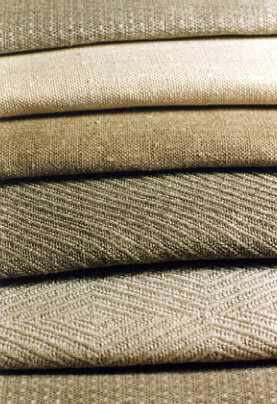 We can copy original patterns which have been mechanically woven from a lnegth of 200m onwards. Woven just as it used to be, uniform herring- bone twill (lace twill 3-1), 100% linen, 1/4 bleached, compact weave - very sturdy for day- to-day use. Width 138 cm, weight 440g/qm. See Ordering samples, fabric group No 4! From 2005 on, see also Ordering samples No. 13, Gminder linen, in any colour!